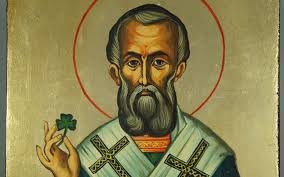 For those of you not in the know, St. Patrick's Day is Ireland's equivalent of July 4th. Only without the national anthem or the nationalism. In Ireland, we don't get all soppy when waving the flag. We don't sing the Irish National Anthem in the middle of a parade. In fact the Irish Anthem, "Amhran na bhFiann" (go to YouTube for a great version: https://www.youtube.com/watch?v=QV7lGmgFovM) isn't exactly conducive for such use. Unlike the US or UK national anthems, with their bold scoring and rousing lyrics, the Irish Anthem is - well - gentle. Play the Irish Anthem in a parade and the soft heart of its music and lyrics will be lost in the coughing roar of rusting tractors used to pull tiny floats created by locals for tuppence and flouting the benefits of the town's insurance company, or the raucous out-of-tune pipe and drum band that never quite gets the beat right, or the reams of kids crying to go home because it's cold and lashing rain and why would anyone in their right minds want to stand watching a boring old St Patrick's Day parade in the roaring rain anyway? You see, it is always cold and rainy on St Patrick's Day. We count on that. The March sun might be blazing in the morning, but by the time the parade starts and as entire communities throughout Ireland pour down main streets to attend their local parade, dark thunderous clouds will have rolled in. The temperatures will plummet, the sleeting rain will set in, and we'll all be miserable. Kids' smiles will turn to tears and parents will desperately try to rescue the situation with a little gentle coaching as in, "Ah fer feck sake, Johnny. We came all the way down here to watch the parade. Now watch it or we're going home and you won't be allowed any Telly tonight." Which only results in the kids crying even harder. Ah St. Patrick's Day. Honestly, you'd think it to be a time of misery. We've the weather to contend with, of course, but then there's the matter of Lent which contributes to everyone's general distress. If you're not Catholic, you might not know what Lent is. Most have possibly heard of Fat Tuesday made popular by the Mardi Gras. That day is one of feasting, knowing that we're going to be deprived of something or other for the next forty days. On Fat Tuesday in Ireland, everyone eats pancakes. Now these are not U.S. pancakes. Rather, they're Irish pancakes - skinny little things that might look a bit like crepes only they're not. The shops sell plastic bottles of inadequate Pancake Batter in the weeks coming up to Fat Tuesday. When poured, it turns out to be a watery mixture that doesn't come close to the hearty pancakes that my mother used to make. The Irish pour all sorts of stuff over them: jam, lemon juice, some sort of maple stuff that aspires to be maple syrup but isn't. Then they hoist them to their gobs, often hating the damned things, but it's tradition so what the heck and at least their stomachs are full. Thee next day being Ash Wednesday, everyone troops down to the Church for Mass. They emerge an hour later with dark ashes in the shape of a cross dobbed onto their foreheads. It might be a blessing, but it's a desperate one because we all know that we're now staring 40 more days of penury in the face. So is it any wonder that parents across the country are so dour during the St Patrick's Day parade? Many are probably still suffering from the DTs and are close to madness due to Lent and abstinence. BUT, and here's the thing. They're also cross due to anticipation. And what do they anticipate? Why Drowning the Shamrock on St Patrick's Day, of course. And here's how it works. After the parade, everyone troops home. There, they'll sit down to dinner which consists of mashed potatoes with bacon and cabbage (another time honored St Paddy's tradition) that's been on the boil for the past 20 hours and sits on the plate like some sort of appalling sludge. Then, with bellies full, and while it might be only 2 in the afternoon or so, they'll walk out the door and make their way to the local pub. For reasons I have never understood, Lent's fastings are shelved on St Paddy's Day. So it's no breach of abstinence to have a good few pints on the day. Which makes the day even more fun because we all behave rather like kids mitching from school for a free day off: we're all getting away with something. We take this break from dourness to make sure we don't all go around the twist before the real end of Lent some three weeks hence. So we'll walk through the rain to the Local and there we'll sit back and join in the revelry. We'll have a pint or two. A hot whiskey or maybe three. An Irish Coffee or maybe five. We'll sing songs and laugh and enjoy each other's company. And for a moment, we'll forget about being soaked to the skin at the parade, and of the Lenten fast that we've all endured, and the fact that it's still raining buckets outside and Spring isn't set to truly start for a good few weeks yet. And having drunk what we've drunk, and at the end of the night, someone might yet break into a soft gentle version of the Irish Anthem. In the quiet warmth of the local, you can hear the warming words sung by Irish everywhere. Words that only now, on this day of nation's pride, can be fully appreciated. Happy St Patrick's Day. And do yourself a favor: drown the Shamrock this coming 17th March, will ya? Before ya drive everyone around ya completely around the twist. 2018 Edition: A SURVIVOR'S GUIDE TO LIVING IN IRELAND NOW AVAILABLE! A Perfect Gift for Saint Patrick's Day. If this blog interests you and you want to learn more about Ireland why not consider purchasing A SURVIVOR'S GUIDE TO LIVING IN IRELAND 2018 EDITION. Are you thinking about living and working in Ireland? Would you like to move to Ireland? Do you want to know how to get an Irish Work Visa? Do you need to know how Brexit and Trump policies may affect your plans? If so, consider purchasing the 2018 EDITION OF A SURVIVOR'S GUIDE TO LIVING IN IRELAND by Tom Richards. This was a grand entry. Loved it every bit as much as your Christmas recollections some time ago. Have a Happy St Paddy"s Day!